"I am Shiva, The God of Death." Took me long enough to see it but I enjoyed Michael Clayton overall. Didn't think it was great or anything but I thought it was mostly solid, if occasionally dull. Michael Clayton's plot is basically the same as Erin Brockovich, though I rather enjoyed a movie about adults talking about adult problems and doing adult things. The acting was strong throughout. George Clooney was very good, but not Best Actor good. No way he could have beaten Daniel Day-Lewis' performance in There Will Be Blood. Tilda Swinton and Tom Wilkenson were both real good. 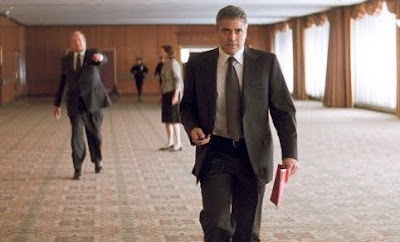 The worst thing about Michael Clayton to me, besides that stupid line "I am Shiva, the God of Death" (which is said twice and draws unintended guffaws each time), was its structure: Michael Clayton opens with an attempt on Clooney's life that fails. The rest of the movie is a flashback that takes us back to that point, which then plays out in an extended, music-swelling, would-be nail-biting sequence of "Oh my god! Will George Clooney be killed?!" Oh wait, we already know he isn't because we saw he isn't in the first 10 minutes. Kind of let the air out of the balloon. If I may paraphrase Homer Simpson's observation of the famous bomb in the toilet scene in Lethal Weapon 2: Before Michael Clayton, I never knew there could be a bomb in my car's GPS. But now I check every time.